The iTablet clone hardware runs on Windows XP, Windows 7, Windows 8, and Windows 8 RT utilizing Microsoft Surface Tablet, Sony, HP, Lenova, and Dell hardware. This architecture is more cost effective because the same client application runs on the iTablet client and Host server. In the case of Apple, the architecture is different requiring a different iPad client and Host application. The iTablet clones are open market place products produced by several manufacturers for cost competitive purposes. An example of one display form is shown below. The screen has a resolution of 1000x800 or higher. Includes all structural damage and assessment inspection companies (including Storm or Fire damage) that provide engineering services for homes, condos, or multi level commercial buildings. One inspection assessment service example could be structural glazing and envelope of protection storm damage assessment. Your team’s data may consist of one or more field technicians entering damage assessment information (data and pictures) over one or more days onto touch Tablet forms. Each form is assembled with site digital pictures from the iTablet or separate digital SLR pictures. Due to Storm or Fire damage, the system operates off-line while accumulating operator data & picture entries. The iTablets with multiple operators enter off-line data including pictures over one or more days accumulating damage item entries. Dependant upon each damaged item, a digital form is labeled as to site location and attached with a representative damaged figure (s.a. double hung window) selected among thousands of items within the iTablet. Optional digital camera pictures can be added from the iTablet or SLR showing item visual damage. We can convert your manual forms (or use ours) to electronic forms (Figure 2) showing a simple Window Form & graphic, where damages (indicated by character pairs) are entered onto the item window graphic when the Form damage option box is clicked. Information is entered into the database utilizing your touch, stylus, or touch keyboard. Figure 1 shows iTablet user data combined with digital pictures sent over the Internet to your office, where a peer application is used to auto assemble the data entry to build reports for your client presentation, and/or used in the court room for insurance purposes. This application runs on the MS Operating systems enabling the court room projector to show damage specific items over any portion of the inspection when challenged by opposing attorneys. Figure1 Data flow of iPad entry, digital camera entry, sending data to Office, and Reporting. 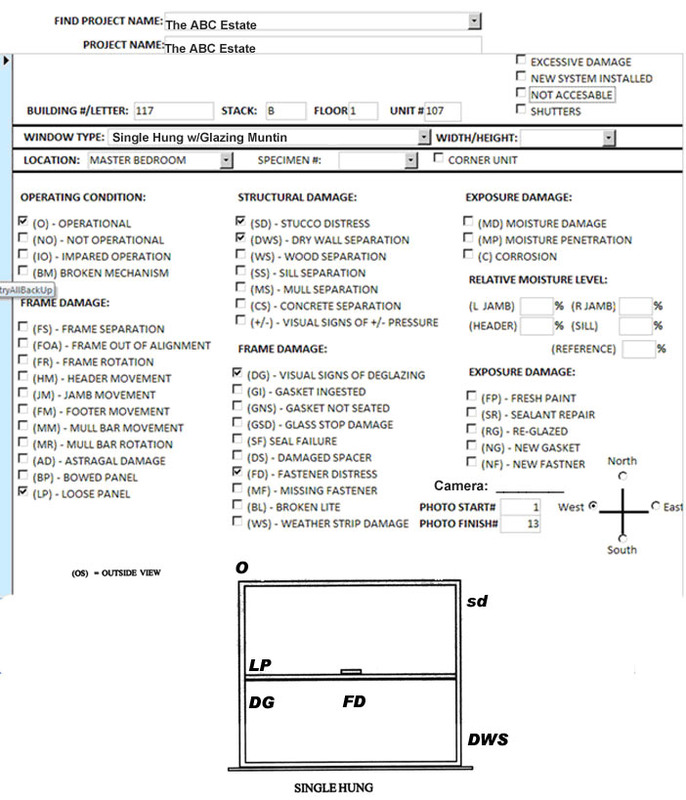 Figure 2 - Typical remote iPad or iTablet Clone entry screen showing one entry item (a single hung window), clicking of option damage boxes are displayed on the item figure as character pairs. After all items are entered, client reports along with statistical damage summaries are provided for your client and/or damage assessment Court presentations.